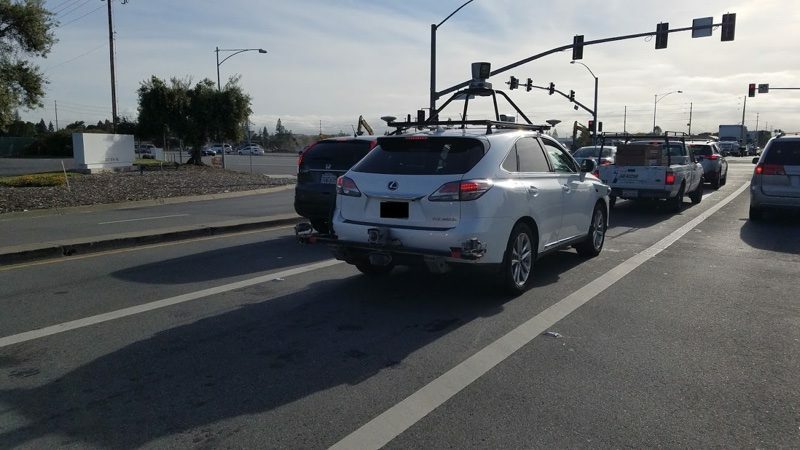 Apple recently obtained a permit allowing the company to test its self-driving software on public roads in several Lexus SUVs, and now Bloomberg has shared details on the equipment Apple is using after one of the vehicles was spotted leaving an Apple facility. 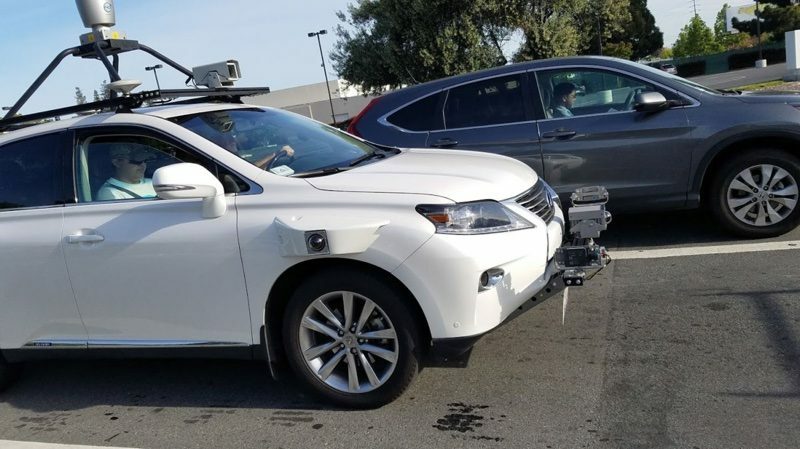 Earlier this week, a white Lexus RX450h SUV was seen leaving an Apple building and was captured in a series of photos by an unnamed source who shared the images with Bloomberg. The vehicle is equipped with multiple sensors, cameras, and radar. The sensors included Velodyne Lidar Inc.'s top-of-the-range 64-channel lidar, at least two radar and a series of cameras. The sensors appear to be products bought off the shelf from suppliers, rather than custom-made, according to an industry expert who saw the photos. The vehicle is distinct from the vehicles used for Apple's mapping project, which uses a series of Dodge Caravans to capture data across the United States for the purpose of improving the Apple Maps app. Apple was first granted a DMV permit to test autonomous vehicles on public roads on Friday, April 14. At the time, a DMV spokesperson said the company had registered three 2015 Lexus RX450h SUVs to be driven by six Apple employees with expertise in autonomous vehicles. Apple's permit application and the appearance of the SUV confirm its work on a car-related project. Rumors originally suggested Apple was developing its own autonomous electric vehicle, but Apple is said to have since transitioned to building an autonomous driving system rather than a complete car. In California, where Apple is testing its vehicles, companies that participate in the DMV's Autonomous Vehicle Testing Program must file Disengagement Reports that outline how many miles were covered with self-driving vehicles and whether any accidents occurred, so Apple won't be able to keep much of the testing on public roads a secret. Apple's car team, led by Bob Mansfield, reportedly has until the end of the year to prove the feasibility of an Apple-designed autonomous driving system. Note to self: if I ever get something terribly ugly installed on the roof of my car, tell people I'm just part of Apple's self-driving car initiative to save face. Self driving cars, once they are in the majority, will change everything. Journey times will be reduced, traffic will be a thing of the past and accidents will drop off the scale. It is the future and to be honest it sounds a lot more comfortable than travelling in tubes. Everyone is coping everyone. How about coming out with something just as innovating but totally different? How about you come up with something instead of demanding "innovation" from everyone else? And yet Toyota/Lexus still won't put CarPlay in their cars. Apple's innovation lies in its ability to take an emerging product category with a frustrating user experience and deliver a polished product made possible by its control over both the hardware and software. What do you have in mind for totally different? A car with three or five wheels, maybe? A car, a bicycle, a Reliant Robin. A car, a bicycle, a Reliant Robin. apple seems a few years behind here..
A few years behind what? They've been working on this since at least 2010. No one has released a completely automated self-driving product. Everyone is still in the testing phase. Tesla has it all down pat. it's over, done, finished with. This is some scheme that sounded great in the Apple "lets re-imagine we are innovators" meeting and is just running out its course. Apple is already real busy with new watch bands. The main thought this triggered in me: when will Apple Maps have street view!? Fancy 3D sataletite view is a cool but pointless gimmick, streetview is actually useful! Have you spent any amount of time on the road? It's clear that you don't need a brain to dive a car!